“What Is College For?” Notre Dame philosophy professor Gary Gutting recently asked, in the NYT. Answer: basically, it’s for ideas. Gutting’s article was interesting to me as perhaps one of the purest examples of “Ivory Tower” thinking I’ve ever seen. Interesting, perhaps disturbing, and finally unconvincing. His evidence for the value of college to students is… self-reported student findings that, e.g., college was “very useful in helping them grow intellectually.” Of course, almost anything that a person might do between the ages of 18 and 22 could be useful in helping them grow intellectually — talk to anyone who’s travelled abroad, gone to work in their uncle’s business, or done national service – and it’s hardly surprising that after years of being told that this is the purpose of their family’s huge investment, students tend to report back the observation. Well, that’s interesting. According to whom, or what? He cites no previous thinker, no historical evidence, no particular cognizance of the history of education even. Then, he makes the amazing claim that “this world [of intellectual culture] “is mainly populated by members of college faculties: scientists, humanists, social scientists…and those who study the fine arts.” This is so fact-free as to be hardly worth rebutting. What about the majority of scientists, who work for governments, pure research institutes, in health/medicine, or in industry? Or the entire media world, which is primarily non-academic? Technology, a radical transformative force in matters intellectual and otherwise, and mostly a non-academic phenonomen, is likewise written off. Even accepting Gutting’s claim, you wouldn’t know from his remarks that there is a vigorous and useful debate going on about how you might detect and measure this “intellectual culture” impact of academia. Does Gutting think that the citizens and governments of the world are going to keep forking over trillions just on the strength of an airy claim? I’d hope not, and I’d hope that he’d hope not, if he believes in critical inquiry. In the UK, the Higher Education Funding Council’s proposed 2009 Research Excellence Framework (REF) sparked extensive debate about impact of research, a useful compendium of which debate is gathered at “The Danger of Assessing Research by Economic Impact” by Prof. Leslie Ann Goldberg of Univ. Liverpool, Computer Science. In the US, a narrower but lively debate has recently attended the work of Mark Bauerlein, professor of English at Emory University and affiliate of the DC-based Center for College Affordability and Productivity. Based on analysis of research activity in four mid-ranked US English departments, he argues that humanities “research” consumes a large portion of department resources while producing hardly any measurable impact, e.g. in citations of the research work. See “The Research Bust”, The Chronicle of Higher Education, Dec 4, 2011. Personally, I think the crucial larger story there is the increasingly threatened and shifting alliance between STEM (Science, Technology, Engineering, Math) and non-STEM disciplines. While we still hear the ideal, exemplified by Gutting’s article, of the unified truth-seeking academy, in practice the pact has been crumbling for decades. It is fairly obvious that the research system of the STEM disciplines works differently than that of the humanities, being based on (or aspiring to, at least) distinct principles of falsifiable hypotheses and reproducible results, with clear pathways to technological application of discoveries. (or at least, aspires to these principles: see “Scientists’ Elusive Goal: Reproducing Study Results.” Wall Street Journal, Dec 2, 2011, on recent interesting results on widespread non-reproducibility). The social sciences partake of this scientific/technical framework to a degree, and also have their distinct own realm of engagement in studying/shaping social policy; professional study such as law has, of course, its own self-evident rationale. That leaves the humanities, uneasily adrift between the truth metrics and justifications more solidly occupied by other disciplines. (with the upstart “digital humanities” energetically embracing science/technology methods, but not necessarily harbored with solid metrics or justifications. Also, often eschewing affiliation with the traditional humanities disciplines, as shown in this chart of the “extra-academic professions,” or what DH leading light Bethany Nowviskie @nowviskie of the University of Virginia calls “alt-academics”). Yet, this complicated landscape is either outside or beneath the notice of Gutting’s “What is College For?”, which doesn’t present an argument, really. I would hardly even call it an ideal, because an ideal would be philosophically consistent and encompassing, rather than being parochially tied to a particular institution such as contemporary higher-ed. No, I would say Gutting’s view, at least as expressed in this article, is closer to mere ideology: that is, a set of beliefs constructed (consciously or not) by a group in order to promote and self-explain its socio-economic position. That’s fine, as far as it goes, but I don’t think it very effectively describes or defends higher education, or much exemplifies either philosophy or intellectual culture. To survey the high schools of the 2011 Siemens Competition in Math, Science, & Technology winners (descendent of the former Westinghouse Science Talent Search) is to see American secondary, public education at its impressive peak. Polished web sites burst with notices of state champion teams, “Top Schools in Nation” awards from various publications, and arrays of courseware / e-learning tools to shame most universities. Curriculums are replete with Advanced Placement programs, wide-ranging foreign-language instruction, outstanding student newspapers, radio and TV stations, extensive performing arts programs, etc. To students in most of the world, including much of the U.S., these places would be almost hard to believe, educational paradises on earth, combining rigorous study, lavish facilities, and seemingly unlimited encouragement of diverse interests and creativity. Remarkably, of the 16 high schools represented, only 1 is private (Horace Mann, in New York). However, most are either in highly affluent and educated districts (Palo Alto, Cupertino, Westport CT, John’s Creek GA) or are highly selective (Stuyvescent, LSMSA in Louisiana). Four schools are in the San Francisco area, four in the NYC area. Asian-American students predominate, making up 4 of 6 individual winners (1st, 2nd,3rd, 5th) and 9 of 14 team winners. Exemplifying the trends, the top prize winner, Angela Zhang, attends the 72% Asian Monta Vista High School in Cupertino, California, one of the nation’s most affluent cities (and naturally, home of tech superpower Apple). A 2005 Wall Street Journal article claimed that Monta Vista was experiencing a “white flight” caused by White American families feeling overwhelmed by the academic focus of the school’s majority Asian American students, notes Wikipedia. What conclusions might one venture from this small but interesting sample? One, public education in the U.S. is extraordinary, in places. You can get outstanding education for your children, without the large private tuitions paid by the elite of most countries, but you’ll probably have to invest greatly to live in one of the elite communities where this “public” good is provided. Also, cultural factors matter a lot — Asian-American focus on education is dramatically reflected in the makeup of Siemens Competition winners — and proximity to leading cities (SF, NYC, Chicago, Atlanta in this case). 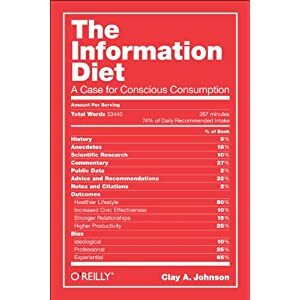 The Information Diet, by Clay Johnson, forthcoming January 2012 from O'Reilly. Overall, I think “information diet” is in interesting and powerful concept. Yes, let’s take charge of our lives, in this as in other ways, to innovate and design and choose. However, before adoping this metaphor too deeply, I’d like to suggest a few objections to consider. 1) We’ve mostly learned not to simply “blame” the obese (or the poor, or disabled), recognizing that this often blames the victim, or doesn’t help. Let’s not “blame our habits” and forget that they are bound up with environment, inheritance, society, and technology. 2) In many areas, end-users don’t control their information intake in the way one can control eating. For example, at school or at work. 3) Food is quantifiable in most important ways, such as calories, fat / carb / protein content, nutrients, etc. Information, however, is not meaningfully quantifiable so, even though the mathematical theory of information misleads us to think so. Information does not, technically, necessarily contain any meaning; a higher-res version of a video doesn’t usually convey much more information or meaning to us. A striking anecdote or 10-word epigram may produce a huge cognitive effect, while watching a terabyte movie file may have little effect at all. Even quantifying information by time spent is problematic, because much of the time we multitask and take in different sort s of information at once. If I write email while watching a Netflix movie for an hour, is that one or two hours of information consumption? 4) The effect of information upon people is not nearly so determinate as that of food. If someone eats a Big Mac, you can accurate predict the nutritional outcome, but if they watch a political ad or a read a short story, their reaction may be almost anything. 5) More generally, the term “information” is a recently arisen term with many implications that aren’t necessarily articulated when it’s used. 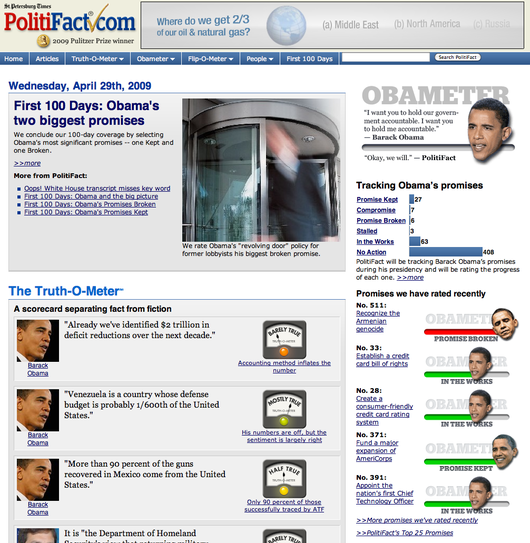 For example it implies quantifiability; the equivalence of different media objects with the same number of bits (“equivalent to X times the Library of Congress..”); the “content” residing objectively in the information and not in the receiver or cultural context or the social act of communication, etc. What about just looking at the natural environment, or listening to our own thoughts? : this is not usually considered information intake, but surely it’s cognitively significant. 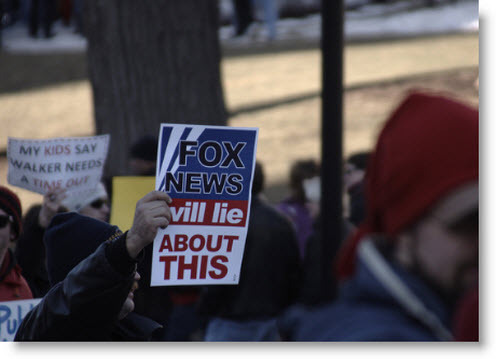 Unless one wants to uncritically or unconsciously follow these significant suppositions, it may be helpful to take any statements about “information diet” and consider them with “information” replaced with other terms such as “meaning”, “perception”, “media”, “knowledge,” or “communication.” Is it still true, or does the assertion not seem to fit as well? What do you think, are these valid objections, do you have any others? From what I gather, the path that led William Deresiewicz to be living in Portland (OR) and writing about it for highbrow journal The American Scholar began with childhood in suburban New Jersey, then going all the way to New York City for ten+ years at Columbia, then a full hour and a half up the road to Yale for another ten+. After this lifetime within a short radius of New York, he flies out to Portland and soon finds himself inspired with masterful, prophetic commentary about “Eastern” and “Western” America, apparently based heavily on readings of prior Jewish sojourners to the West, Bernard Malamud and Leslie Fieldler. 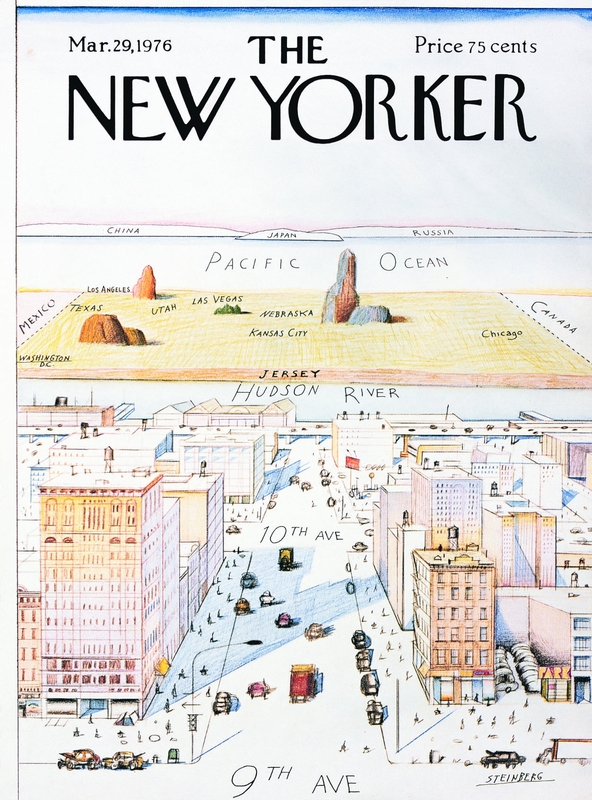 Saul Steinberg: "New York, Center of the Universe"
Bill, I hate to tell you this, as one of those excessively polite Portlanders, but your commentary paints you as a walking cliché of the Eastern Innocent Abroad. It’s a type instantly recognizable to us literate hicks out here in the territories, upon whom literary New York periodically drops a roving correspondent to gather glib, retailable anecdotes. You come off as filled with the leaden provincialism that lets New York types consider almost every other place a naive province, no matter how little they know about it. Haven’t you ever heard that a provincial is someone who judges wherever they are by the standards of where they came from? That’s you. A cosmopolitan, which evidently you’d like to think yourself, is someone to whom nothing human is foreign, who appreciates how people live, wherever he finds himself. As it happens, I’ve had quite a bit of experience with New York provincials, and NE vs. NW. I was born in Portland, lived until age nine in London (dual U.S. / U.K. citizen), then in Portland through high school, then spent twenty years going between East and West Coast while in college at Yale and then living mostly in New York City while in grad school and working and traveling extensively for work; now I live in Portland again. For all those years, I’ve constantly compared places and people and experiences, and met innumerable people who’ve only lived in one part of the country, or have only superficially experienced other places. While I love New York and other Eastern cities and appreciate their many richnesses, I’ve also come to appreciate that some of the most narrow, ethnocentric, judgmental people I’ve known are from the New York area, both the native and arriviste variety. While most people, I find, think of themselves as just living in one city among others, many New Yorkers I’ve met seem to frequently dwell on why they could never live elsewhere, why theirs is the “Capital of the World”, the paradigm of “city”, and other such totally self-absorbed and small-minded obsessions. They learn, at first jokingly, to think of America as largely “flyover country”, and so, all too easily, develop a flyover mentality in which practically everybody else can be easily written off as “red state” or “suburban” or “Western” etc. This is the noxious provincialism of the Metropolis, to which even the — or perhaps particularly the — elite-educated and cultured may succumb. So you met an awkward fellow in the supermarket who was pleased to find a Jew? And if you one goes to New York everyone one meets is what, Mikhail Baryshnikov or Moses Maimonides? No, you might well meet, say, a lot of aggressive, car-honking, swearing, impatient people, upon whom you could, if you’re a real yokel, quickly erect a great stereotype about the locals. But that would be the kind of dumb, misunderstanding thing us moronic heartland tourists would do, right? Thanks for the lengthy explication of the great writers in whose path you hope to tread. But really, one is left devoutly wishing you could put your literary lenses away and actually pay attention to the place you’re in. Close reading of Malamud and Fiedler (whereby Oregon and Montana are, remarkably, globbed into one West) seems to have saturated you with clichés of cow-towns, philistines, “bovine imperturbability,” ahistoricity, etc. Then, wow, you observe all the same things in Portland! Now the skeptical inquirer might ask, did Fiedler and Malamud perfectly describe and predict this, or… am I seeing them rather than seeing anew? > love-hating one another…Making their own city. Making their own America. This reads less as observation than as tenth-generation bastardized Saul Bellow. Really, it pains me. The absence of ethnicity you observe here is strangely lost on my friends who teach in SE Portland classrooms full of Russian, Eastern European, Mexican, Central American, and SE Asian immigrants, or those teaching in suburban classrooms full of Israeli, Indian, and Chinese children of technology professionals. There are large areas of town in which you could drop into any restaurant and probably not find a native-born American working there. > There isn’t anything that represents the past. Here’s a clue: if ever you observe no irony, there’s a good chance you’re just failing to detect it, and the joke’s on you. If you can’t detect the past, that’s because you’re not perceptive enough, not because there is no past. For example, a proud and prominent part of the city’s history is the vibrant 100+ year-old Jewish community of South and now Southwest Portland, which seems to have escaped your notice. It sounds to me that what you miss is really certain mannerisms — a certain, deeply profound way that a woman on the subway looks at you and is like, so totally “meta,” for example. A certain ravenous, predatory, wounded quality among the warring ethnics, perhaps. But, of all things, couldn’t you have anticipated that mannerisms are exactly what you’d expect to be different in different places, and it could be an opportunity to outgrow or test yours? Being unable to tolerate the locals’ mannerisms says precisely nothing about them, everything about you. 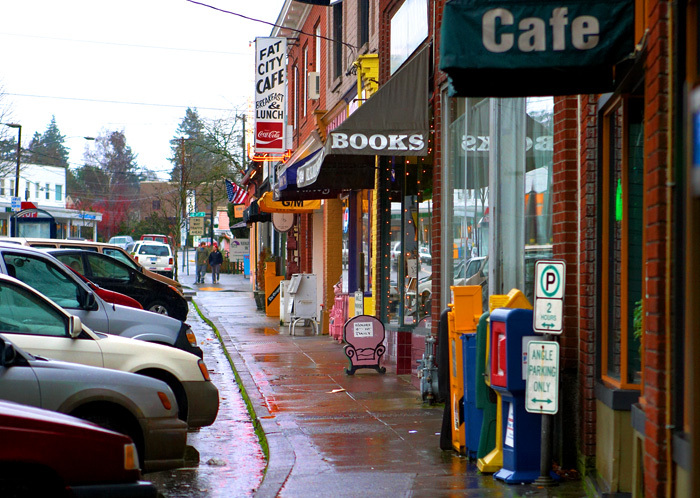 Portland is filled with well-educated, literate people, and a large portion of immigrants from other places and countries, certainly not just or even particularly from the Midwest as you say. People here may have as much or more perspective as you, perhaps just offered up less presumptuously and preemptively. Perhaps the problem is, as you observed in another essay, “an elite education” [such as yours, at Columbia] “makes you incapable of talking to people who aren’t like you.” Yes, out here in Portland, many of us, to our undying shame, aren’t like you, and so in silence we labor, unblessed by your discourse. Some of the energy and curiosity out here, which has apparently escaped your regal literary gaze, includes many of the top research and engineering labs for the world’s largest chipmaker, Intel; and the world’s largest sports and shoewear industry cluster, led by #1 company and brand worldwide, Nike. Also here are key nodes of the open-source world, including the creator of the Wiki and the creator of Linux; a thriving startup scene, and the nation’s highest recycling rates and bicycle commuting rates, and a large community of leading environmental building experts. Also, a healthy literary community, the world’s largest bookstore, and the country’s 2nd most heavily used library system. I don’t know how the locals do it, what with our bovine imperturbability and all, but it’s something you might be curious to check into while you’re passing through, if you can get past the noserings and what you see as the disturbing lack of angst among us freaks of nature. Anyway, It’s great that you’ve learned so deeply who you are: an “Easterner”, was that it? It’s unfortunate you haven’t, apparently, learned more about how others might see you, or see Easterners, or learned more about the city and region which finds itself patient host to your labors of self-discovery. Most of all, It’s unfortunate that you haven’t discovered the larger self that such learning might have graced you with, because then you might rise to the level of a writer capable of telling us about our time and place, rather than just so narcissistically about you.